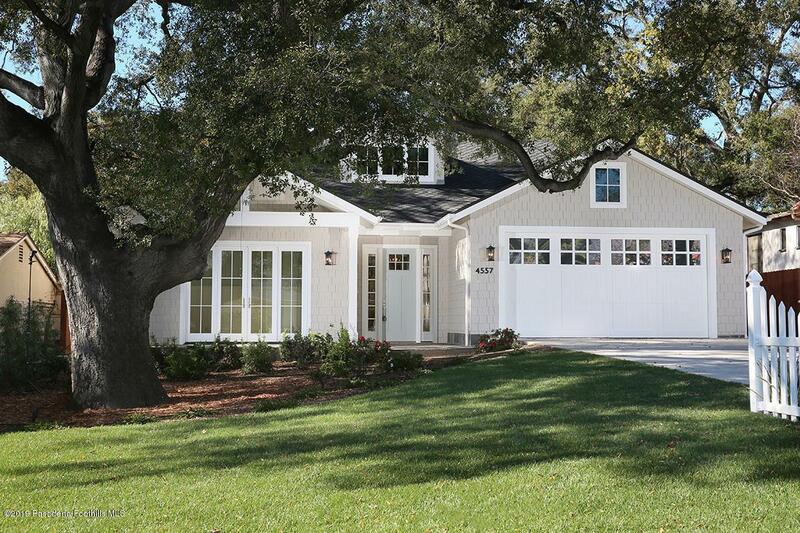 Brand New Construction in La Canada Flintridge! Welcome to 4557 Alta Canyada, a picturesque home with a thoughtful open floor plan. This CH Anderson built home features beautiful finishes throughout by Tiffany Harris Design. The entry features European oak floors, ship-lap paneling and a visual comfort chandelier. The living room/office with board and bat paneling and french doors looks out to the grassy front yard.The kitchen/family room is open and airy with an entertainers purpose featuring custom designed cabinets, comfort pendant lighting, Thermador Pro Appliances and a ship-lap fireplace with custom designed built-ins. Off the family room is a covered back patio with a fireplace the leads to a grassy back yard. The master suite is complete with a custom bathroom featuring Arabescato Carrara Marble, custom designed vanities and Kohler Artifacts plumbing. Completing the ground level are two additional suites. Other amenities include indoor laundry, upstairs bonus space, two car garage with custom designed garage door, slate walkway and front porch. Move right in to this charming La Canada Flintridge home.